Stimulating Sensory Paths for eating and activities of daily living. When your loved one can no longer initiate self-care activities, it is still possible to engage them in completing the activity. We can help by stimulating the sensory pathways. Those in later stages of dementia have four sensory places remaining – the soles of the feet, genitalia, palms of the hand and mouth/lips. Think about a young child developing. Toddlers walk best at the beginning in bare feet; the soles of the feet transfer information to the brain that helps the child to balance. Young children discover items by touching them and placing them in their mouths. Self-pleasuring is also a normal part of sensory development. During care and meal times we can help to stimulate the motor pathways through sensory stimulation and help your loved one engage in old-memory activities. Place your hand palm to palm under your loved one’s hand. Hold the utensil in your finger and thumb. Guide your relatives hand and arm to follow the normal eating pattern of scooping and raising it to the mouth. 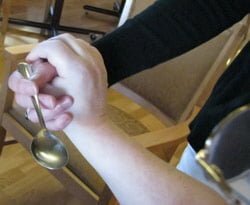 Once you feel that the pattern is established, maintain palm to palm contact and slide the utensil into your loved one’s fingers and continue. If you feel that the motor response is intact, remove your hand and see if your relative will continue. Follow similar technique as during feeding. Maintain palm to palm contact to provide sensory stimulation and hold the washcloth, hair brush or toothbrush in your hand to begin the activity and guide your relative’s hand through the activity. If the motor pathways are triggered, your loved one may be able to continue on their own. It is important to ensure that your loved one is using their dominant hand to complete the activity, as they always have. Imagine trying to write or feed yourself with your non-dominant hand! Your motor pathways haven’t been established that way. You would quickly want to switch back to your dominant hand.